Patented Pomella® Pomegranate Extract is a standardized breakthrough formula of the primary natural antioxidants of the pomegranate fruit, punicalagins. It is a naturally potent antioxidant backed with clinical research. Pomella® delivers readily absorbed, measurable, and efficacious punicalagins and metabolites and is known to promote a wide range of health benefits. Pomella® Extract was developed to deliver high amounts of bioefficacious ellagitannins, the major of which is punicalagins. Punicalagins and their metabolites, namely urolithins, deliver an array of antioxidant related health benefits. USP / ICH / Prop-65 standards. The approach to developing Pomella® Extract was quite visionary. Flying in the face of the status quo for nutritional development, the evolution of Pomella® in university research was not driven by business interests or cost, but by what offers superior bioactivity and bioavailability. 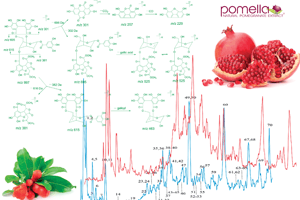 Pomella® is the culmination of a complex research process that compared dozens, if not hundreds, of different forms of pomegranates in various antioxidant and bioavailability models. Athletes, for example, are well informed about the health benefits associated with antioxidants and the potential to optimize performance and reduce to recovery. However, not all antioxidants perform the same. 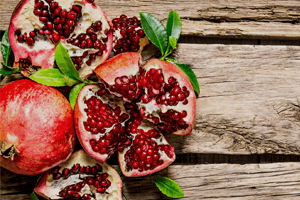 Our new download on Pomella® Pomegranate Extract discusses how our patented and proprietary natural pomegranate extract can work for you. Find out how Punicalagins support sports nutrition.